So I thought I’d do a little update on my R.I.P. Challenge. I absolutely love this time of the year and if you know me, you know that Halloween is my favorite holiday. I love the costumes, candy, scary reads and even scary movies. I’ve already read two of my R.I.P. reads, one short story and even watched a good film for the season. 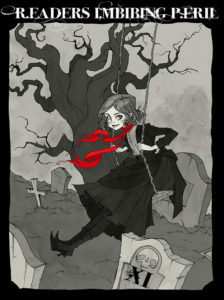 One of the books I recently finished is Witch by Barbara Michaels. This has an old house, a ghost, a story about a woman accused of being a witch, strange townspeople, you name it. In the story Ellen March finds a wonderful home tucked in the woods. Her family is off to college, working abroad, etc. so she thinks this will be the perfect place to make her own. She is determined to meet the residents of the small town and she’s intrigued by the handsome next door neighbor too. It all sounds wonderful until she sees a ghost in her bedroom. I enjoyed this one and could just picture myself like our main character, enjoying her old house, surrounded by books and spending the afternoons reading. Of course, a ghost might be an issue. Anyway, if you are a fan of Barbara Michaels I think this is one to add to your collection. Now if you are looking for a good Halloween movie, you’ve got to check out The American Scream. Don’t worry, if you don’t like being scared or gory movies you will be just fine. This is actually a documentary about a community in Massachusetts, who build elaborate Halloween wonderlands every year. They build mazes, turn their homes into haunted houses, they create monsters and even dress up themselves no matter the age. The movie follows three families as they share why they go through all the trouble and what it means to them. I cannot imagine taking decorating to this extreme but it was definitely fun to watch. I appreciated that the biggest draw for all the participants was the feeling of community they got from doing something like this in their neighborhood. I would love to see these haunts in person that’s for sure. Let’s see what else I can add to my reading and watch list before the RIP challenge ends. How is your challenge going and do you have any good books/movies to recommend? We’ve already got a couple more scary films in our Netflix queue so let’s see which one we decide on over the weekend. 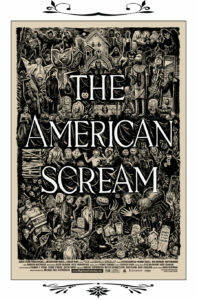 The American Scream looks worth checking out! I checked with my library about Witch, but they have evidently culled all but one of Barbara Michael’s novels! I may check with Abe’s books because I would love to read some of her books again, and Witch would make such a perfect R.I.P. read. American Scream sounds like fun! I will have to look for that one! I just finished season one of Stranger Things on netflix — so good! The neighborhood we live in makes a huge deal about Halloween, and so I think a few of my neighbors might be able to relate to the families in American Scream. I’ll have to check that out. Witch sounds like a good one too! Love the sound of American Scream! I will have to look for it. I wish I had partaked in this event. Next year, I promise! Hopefully, I will be reading more next year too. I’ve been trying to do an update too, but then it comes down to reading more or writing about it: you know how it goes. So far, the reading is winning, but the writing will catch up soon. Glad you’re enjoying the season so far! I need to check out American Scream–now that sounds like something I could manage watching. I don’t do well otherwise when it comes to scary movies!